We offer the best needle gauge in the market. It is the best not only because it is extremely accurate and because it includes more needle sizers than any other needle gauge. No, it is the best because it can have your shop's name permanently printed on the gauge! That's right, we make our famous gauge with our customers' logos printed on the surface. We have made over 200 custom gauges for shops Worldwide in the last few years and the shop owners love them. They love them because when that customer leaves their shop with the shop's name/logo on the needle gauge, that customer is reminded of that shop every time they use their gauge. Plus, our gauge is made using high tech CNC cutting machines where every needle hole is drilled by computer controlled cutters. They are made in the USA. 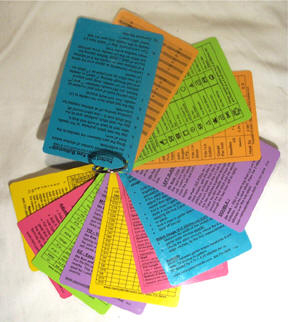 Plus, they are part of a system in which the gauge and our Knit-Kards all fit on the same key ring. 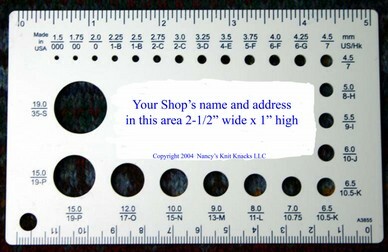 Without question, the best item to put your shop's name/logo on is a high quality needle gauge. We are the only company in the market that offers such a product. Pricing ranges from $2.50 each for 125 units in full retail packaging and goes down to $1.90 each for 1,000 units in bulk packaging. Other quantities available are 250 ($2.20 - $2.30) and 500 ($2.00 - $2.10). For more info on our custom needle gauge, visit this link. You may also order gauges on that link. Here is more information about our gauges and the ordering process, etc. Inevitably, however, we get late-comers who either forgot to order or didn't realize we had a schedule. So we do the best that we can to aggregate enough orders to run production in between the normal dates. So if you want to order custom needle gauges, get your artwork (or text) together, and contact us. Click here to see a sample of a Needle Gauge Proof (please ignore line thickness variations, converting it back to a pdf for viewing purposes causes that and it will not be in the final product). Your artwork needs to be a vector graphic in order to look crisp and not jaggy. Call us and we can walk you through the process. Think about it, your customers can be holding a high quality gauge with your name and logo on it. There is simply no substitute for a gauge with your name on it when it comes to personalized products. The most popular order qty's are 125 and 250. Most shop owners simply get the bulk pack (poly bag and hang tag are not included). This saves $.10 per unit. Having them bagged and tagged may delay your order a few days. Artwork should be 300 dpi vector art if possible (Illustrator, Corel Draw, etc. ), Black CYMK 100%, please avoid overly intricate designs as well as "dithered" images. 2.5" wide by 1" high size - please size your artwork accordingly prior to submission. If you cannot get it to look the right size on your computer when you print the logo in this size, then we will not be able to either. Embed all fonts and flatten all images. Highly intricate designs with fine lines and shaded areas may not print well and these MUST be submitted in vector art format. If you only have a 300 dpi .pdf or .jpg format, you can submit it and we will do what we can to make it work. We work with a 3rd party company that specializes in vectoring images for a reasonable fee. We do not mark their work up. If you would prefer, however, to work with them directly, here is their website http://www.vectorfactory.biz/ It takes 1-2 days for them to create your artwork. Once you have the artwork, please subnmit it to us for review. We will submit proofs to you for approval prior to running production. You will have 2 or more days to approve them but please do not delay your approval or rejection. The next ordering period runs from May 22, 2015 through June 9, 2015. Please order your gauges during that time and then send in your artwork. We can verify that it will work "as is" or if it needs tweaking. Either we edit it inhouse or we can send it out to our partner who can vectorize it for $15-50 (depending on the complexity). Gauges will be delivered within 3 weeks or so of the close of the ordering period. Next Ordering Period after this one will be in September 2015. Those units will become available by early-mid October 2015.